Skin & Bones. Motorcycles as Art. 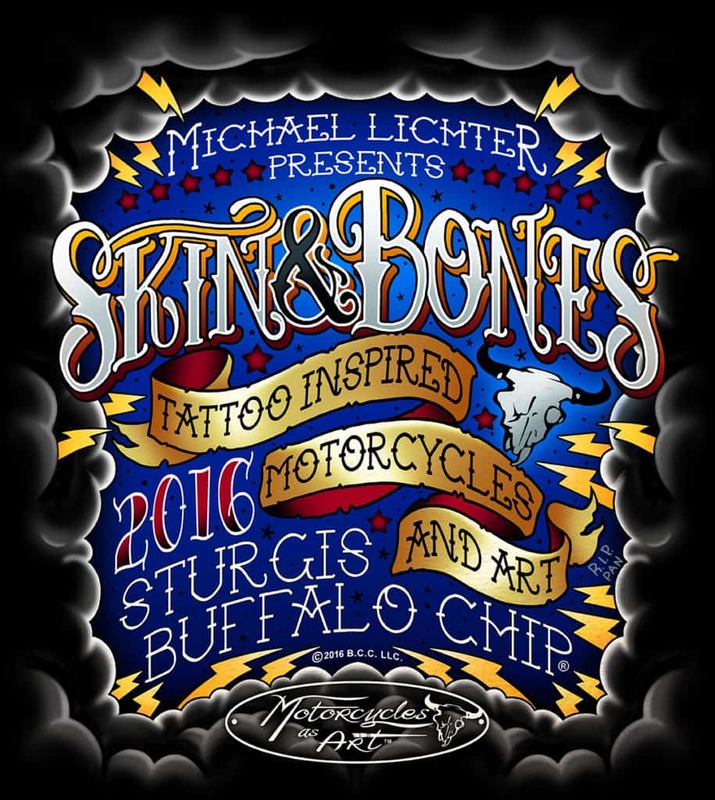 Michael Lichter presents SKIN & BONES – Tattoo Inspired Motorcycles and Art 2016 at the Buffalo Chip. I’m excited to participate in this year’s prestigious art show at the Sturgis Motorcycle Rally 2016 where the motorcycles are art. For me, motorcycles are always art. Two of my tattoo inspired original artworks will be showcased among thirty world class motorcycle builders. I’m looking forward to meeting a lot of these great artists – legends in the world of custom motorcycles. Like tattoos, my paintings tell stories of individuality, freedom and remembrance. Aside from cave paintings and early wall art, tattoos are among the earliest forms of art. We collect them to celebrate our passions, spirituality, memories and to mark accomplishments. Each shares a story and connects us to one another. I got my first (and only) tattoo in 2007. After considering it for a long time, I knew it had to be something profound that meant enough to me to wear for the rest of my life. After all, tattoos are a permanent statement. When my father passed away in 2001 I knew I wanted to pay homage to him through art – somehow. Since I had considered a tattoo for years, it seemed like the obvious choice, but it took me a while after his passing to resolve how I would commemorate his memory. We shared a passion for motorcycles and often rode together. He was a charismatic man of optimism, creativity and new beginnings. My ink needed to be a positive remembrance and amazing. I decided on a powerful Phoenix symbolizing my birthplace, where my father’s journey ended, and my rise from the ashes to a new beginning. And while he is long gone, my ink is a daily reminder to be the best new me each and every day. Tattoos are a healing art. I’ve seen that over and over throughout the years. As a young man I considered becoming a tattoo artist. My art took me in another direction. First, as a designer, then as a wall artist/muralist for Hollywood Video and then on to my epic motorcycle paintings and larger-than-life art nudes. Today, my art embodies my passion of America and motorcycle lifestyle. Like tattoos, my paintings tell stories of individuality, freedom and remembrance. Art is like that. It connects us. LOTUS tells the story of transformation – turning life’s hard times and challenges into a thing of beauty, and the overcoming of obstacles that detour true happiness. This artwork was new for me in many ways. LOTUS is the first figurative piece that I’ve created where my model/muse has a tattoo (but not my last). LOTUS is also the first in a new media combination of graphite on a beautiful heavy weight archival watercolor paper, resulting in a beautiful skin texture. When you look at LOTUS, think of her as life-size, so LOTUS shares a commonality with her sister paintings in size and scale. Both A.D. Cook artworks above will be on display for the duration of the show. Lots to see and it’s all free. I promise to follow up with tons of great pics of the bikes and art on display. No doubt I’ll see some world class tattoos as well. Sunday, Aug. 7 through Friday, Aug. 12, 2 p.m. – 10 p.m.